This post follows posts about EPP, PES and other candidates for President of the European Commission, and President of the European Council. 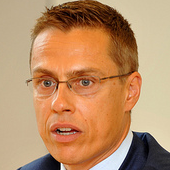 Currently Europe Minister, and formerly Foreign Minister, Stubb is the rising star of Finnish international politics. A former MEP and expert on EU politics after his time as a Professor at the College of Europe, Stubb knows EU foreign affairs very well. He comes from a Eurozone country, and from the EPP, the EU’s biggest political force. His administrative competence would be welcome in comparison to the current incumbent, although his hyperactive honesty on social media might irritate some traditionalists. 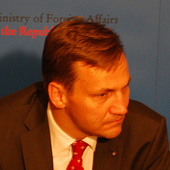 A former journalist, and political refugee in the UK during the 1980s, Sikorski combines Thatcherite free-market conservatism and a determined commitment to EU integration. The thawing of Brussels-Warsaw relations in recent years owe a lot to him and his Prime Minister Donald Tusk. His party’s presence in the EPP, and Poland being one of the EU’s rising powers, may assist him, while his outspoken positions – not least his critique of the UK, and calls for Germany to be more assertive – would worry some. 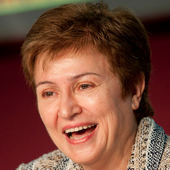 The surprise in the current European Commission, Georgieva has been determined and effective in the Humanitarian Aid and Crisis Response role, just quietly getting on with the job while critique has been levelled at other Commissioners. Georgieva was previously employed in other international organisations – this separation from party politics could be an advantage, but would she be adequately respected by Member States’ foreign ministers? Her nationality might also count against her. Ashton has been low profile in the High Rep role since 2009, and while Georgieva would undoubtedly be more effective, would she be able to give the position a higher profile? 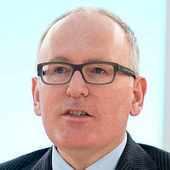 Mentioned in a previous post about possible PES candidates for President of the European Commission, Timmermans is currently foreign minister in Netherlands and could hence realistically perform the High Rep job in Brussels. Further, if as happened in 2009, a party political balance is sought for the top positions, the PES could once more end up with the High Rep position. Timmermans’s nationality and international experience would assist him. The nearly man of German centre-left politics, and a former foreign minister in Berlin, Steinmeier would be a safe (if somewhat uninspiring) choice. 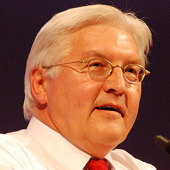 His nomination would to a certain extent depend on the outcome of the 2013 Bundestag election, and what role – if any – the SPD would play after the election. The question would be whether Germany would seek a foreign policy portfolio in Brussels rather than something economic. Swedish foreign minister Carl Bildt would be a fascinating candidate, but does he want the position, and might his outspoken views over the years mean others would not want him? That is the reason he does not feature in the top five. As ever, comments and additional suggestions are most welcome! What about Bernardino León? He is a very talented carreer diplomat, recognized by all political sides. Why do we need a politician doing a specialist’s job? My money would have to go on Kristalina Georgieva. Reason: the government leaders have had a happy time with Ashton’s tenure, or what there was of it. They definitely do NOT want a determined go-getter with views of his own. That would rule Timmermans out, for one. Georgieva seems to be a quiet, competent worker bee, effective in her own, limited way. The government leaders will like that. Kurt – I assume you’re referring to this from Berlingske. I think it’s wrong – Thorning is much more likely to be Commission President or European Council President, than High Rep. She has no foreign policy experience really, and after Ashton finding someone that does is a priority. From Denmark the outsider – Prime Minister Helle Thorning Schmidt will be part of the Game. I would add Schulz to this list. There may well be a grand coalition after the Germans elections in September. At the same time I don’t really see the Socialists winning the EP elections next year. Steinmeier is probably not really interested (family reasons and lack of ambition for a 80 hours a week job). Fabius voted No to the Constitution, and I hence think that would rule him out. Also he and Bonino will not have been in their respective posts long (although that would also rule out Timmermans as well I suppose). D’Alema seems to have been out of mainstream politics for too long. Don’t forget some of the PES candidates mentioned for the Commission presidency, like Helle Thorning-Schmidt and Pascal Lamy. Also, no mention of Massimo d’Alema, Emma Bonino or Laurent Fabius?